Anpei currently has 246 associates, of which 151 are companies, 83 entities oriented to R&D in the productive sector and 12 individuals. 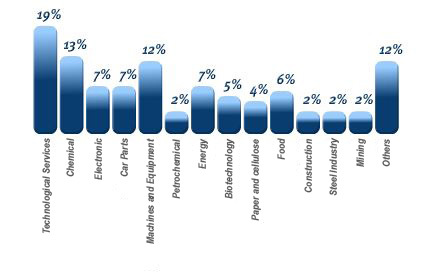 The 151 member companies belong to sectors such as: technology services (19%), chemicals (13%), electronics (7%), automotive parts (7%), machinery and equipment (12%), petrochemicals (2%), energy (7%), biotechnology (5%), paper and cellulose (4%), foods (6%), civil construction (2%), steel industry (2%), mining (2%) and other (12%). Regarding to the members size, 55% are large (500 or more employees), 16% are medium-size (between 100 and 500 employees) and 29% are small (fewer than 100 employees). The origin of the capital from these companies is, mostly, national, representing 73.5% of the total of members, while the multinational companies represent 26.5%. Geographically, the highest concentration of members is in the Southeast (73%), followed by South (23%), Northeast (2%), Midwest (1%) and North (1%).